Do you sometimes wish you could take a long sabbatical to the allusive Themyscira? We don't blame you. The mountainous island not only seems like a Grecian paradise but it might actually be a paradise. It was created to hold Zeus's favorite ladies after all. If the Amazonian clan ever wanted to open up their home to strangers they would be able to run an impressively successful spa resort. Just think about it. The islands baths run with glowing blue water, it would be a pretty magical place to get a massage. Then there would be the fitness factor. These ladies know how to make fitness seem essential so you could easily set aside your aerobics DVDs for a hands-on experience. You never thought you'd get fit via sword fight and shield launch but you'd never had this much fun downward dogging or doing squats. Well, who knows if you'd be able to come back to the real world after an experience like this. Your week-long vacation just might turn into a month and that could turn into a year. The years might just go by until all of the sudden someone comes by to tell you that the world needs you and draws you back to reality. 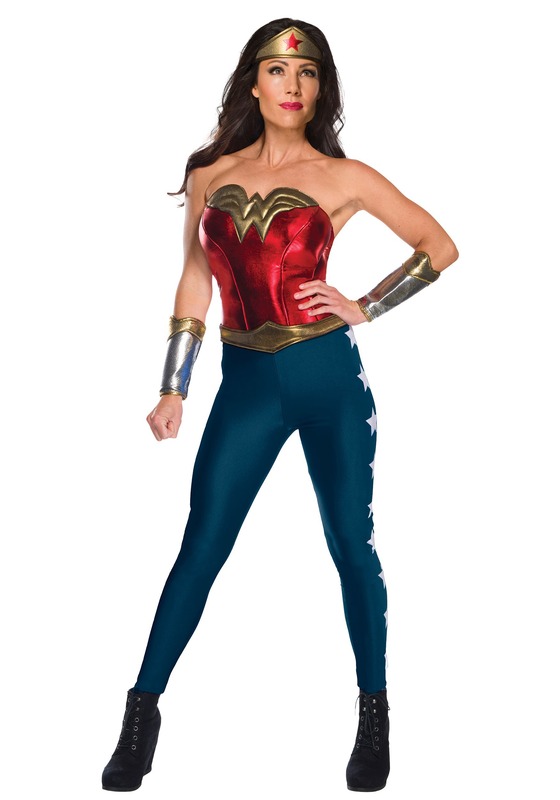 You might not get to vacation for years at Themyscira but you'll be ready for the call when you don this eye catching and flexible costume. It has dark blue leggings with stars along the side and a gold and red sweetheart neckline bustier, paired with the silver and gold gauntlets, and the golden crown with a red star. You'll be ready to take on whatever challenges people are throwing your way. Who knows, maybe you'll even figure out that shield launch! Runs Small: Please make sure to double check size chart.